This was so fun! We were with agroup of 8 and everyone of us absolutely loved it. The crew was so helpful and so friendly. Worth every penny spent! 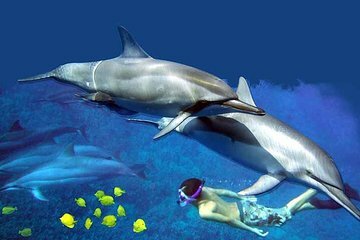 For anyone that likes snorkeling this is a trip you will want to do. We snorkeled and saw several dozen dolphins including some that came pretty close up. The reef was very clear and had interesting fishes. Dre and Captain Laura were great! Due to confusion on our part, they accommodated us by picking us up at an alternate site. While watching out for our safety, they provided good instruction on use of the equipment and how to exit the boat. We had ample time to snorkel at the Captain Cook site. Both Dre and Laura provided good information about the sites we visited. While the dolphins were not at the expected sites, they caught sight of a pod on the way back to the harbor. We took a few minutes to watch them as swam past us. We would highly recommend this tour. This tour was one of the highlights of my Hawaiian adventure. We saw 4 dolphin pods and were able to view one of the pods in the water. Captain Laura and first mate Dre were the best crew. This tour is different from others as it is very respectful of the dolphins and will not chase them. This was an amazing tour, many many cute dolphins will be around you, my 2 teen daughters loved it so do I. Crew was very nice and very respectful for the marine life which is the reason we decided to see them in wild life rather than in captivity. We are looking to booking them again because the experience is just unbelievable. Absolutely awesome! Captain Chris was superb,,,informative, patient and helpful. This was a highlight of our trip. True to what they say! We were able to swim with the spinner Dolphins and check out some cool reefs and underwater caves! This tour was the highlight of our entire trip to Hawaii! Best way to travel by fast zodiac in a small group. Snorkelling was the best by FAR with clear waters, abundant variety of fish and friendly and knowledgeable staff. Thanks for a fantastic trip! Skip Molokini Crater in Maui and do this!! This was the highlight of our trip! The staff was amazing and very fun to be around. It didnt take long for them to find the dolphins and we got to swim with them for about an hour. It was amazing!!!! They were so close!! and there were dozens of them! We also got to see other landmarks and snorkel in clear blue water. Well worth our money. A dream come true!! It was soooo worth it to swim with them in the wild instead of in a sea life park. It is a workout if you are not used to swimming in the ocean!! (Ended up being too much for my husband who is not a strong swimmer- he went back to the boat). Bring a waterproof camera! !